The association EnoRev’ was born of the collective efforts of volunteers motivated by a single goal: seeking motor functional autonomy for young children suffering from cerebral palsy. Faced with a lack of adequate rehabilitation methods in France, EnoRev’ has had to scour the medical world for suitable therapies. Too often the families of these children are told that nothing can be done, when in fact so much can be achieved while the child is still young (before the age of 3) and has brain neuroplasticity, which means their little brains still capable of adapting. But the clock is ticking and EnoRev’ is leading the race to help families beat the clock. Provide financial and moral support to those families struggling to rehabilitate children with cerebral palsy affecting their motor skills and development. Share their experiences and lessons learnt to help these families. Promote proven solutions (solutions from lessons learnt or practiced abroad). Grow a sustainable therapeutic base in France by financing the training of therapists in neuro-motor re-education (specifically the MEDEK C.M.E. method). The association may be young, but it has been very busy this year! 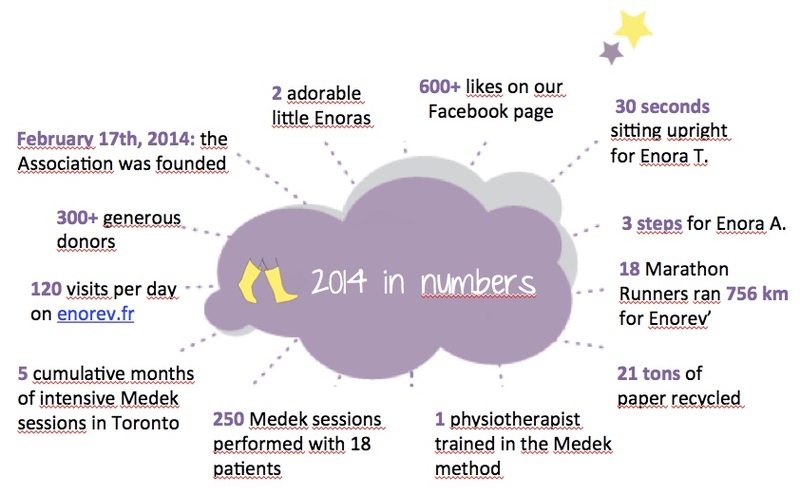 Here is a list of what we have achieved the first year, because actions speak louder than words! The following two videos will help you to understand why the association was founded (but this is in French, sorry ! ).